Johnson’s provides installation, service and support for several different types of dehumidification systems and controls. Some are stand-alone systems and others automatically operate in concert with air conditioning systems and controls. Some dehumidification products are small appliances that provide supplemental control of indoor relative humidity levels when used to supplement air conditioning systems and operate when the demand for operation is based upon indoor humidity control needs rather than indoor air temperature control. Other large dehumidification systems are high capacity systems that process outside air bringing its moisture content down to suitable levels before delivering it into the conditioned space. Air conditioning systems remove airborne moisture from conditioned air at the same time cooling the air to maintain the desired space temperature. When air conditioning systems are operated continuously and for long enough durations to keep indoor relative humidity levels within desired levels, supplemental dehumidification systems are not required. When space temperatures are not higher than the desired indoor temperature but the indoor relative humidity level is higher than is acceptable ; supplement dehumidification systems are used to keep indoor RH levels in check without over-cooling the space. Air conditioning systems are designed to cool and dehumidify indoor air by chilling circulated indoor air, passing it across a cold indoor cooling coil to lower its temperature and chilling it to a temperature below its dew-point to reject moisture in the form of condensation from the air. The heat removed from the indoor air is rejected to outdoors through an outdoor condensing unit. The result is that heat and moisture are removed from the indoor air anytime air conditioning systems operate. Simultaneous humidity removal as a result of space temperature control limits the air conditioning system’s effectiveness for indoor RH control to the need to lower the space temperature. Dehumidification systems can remove indoor air continuously without lowering the space temperature. Heat from the sun warming building components, along with indoor heat from lighting and appliances are normal Heat Load Sources that raise the indoor air temperature above the T-Stat setpoint initiating a cooling cycle.The air conditioning system removes airborne moisture as it lowers the air temperature. Any time the air conditioner is running moisture is being removed and the indoor air temperature is dropping simultaneously. Humidity Control using conventional AC equipment is the coincidental result of a continuous heat load source creating an AC demand to run a cooling cycle and lower the indoor air temperature. Heat is required to use air conditioning. If no heat is present the thermostat will not operate a cooling cycle. AC Operation Requires Heat The conditioned space will not have sufficient moisture removal if the result of air conditioning system operation is not frequent enough or for long enough durations to control moisture,coincidental to indoor air temperature control. If there is no heat load and an air conditioning system is forced to run anyway ; temperatures will drop continuously until freeze-up occurs or on some systems until shut down occurs on systems with integral freeze-up safety controls. Attempting to improve humidity control by over-cooling a building can cause additional indoor moisture problems. Moisture migrates more rapidly through building materials toward lower temperatures wetting the materials faster. Condensation occurs on airhandler cabinets, ductwork other components that are over-chilled by the air inside them. The cold damp indoor environment created encourages microbial growth in the air and on indoor surfaces. Variable speed and multistage air conditioning systems extend the duration of effective humidity control by automatically adjusting system cooling capacity to sustain and enhance dehumidification during operation in the cooling mode. If there is no heat load and an air conditioning system is forced to run anyway ; temperatures will drop continuously until freeze-up occurs or on some systems until shut down occurs on systems with integral freeze-up safety controls. 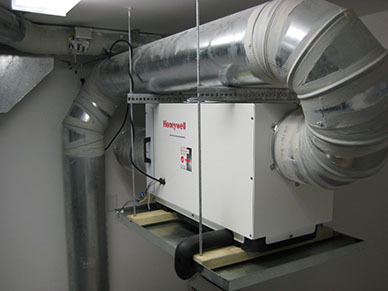 Dehumidification equipment cools and dehumidifies indoor air by chilling circulated indoor air, passing it across a cold indoor cooling coil to lower its temperature and chilling it to a temperature below its dew-point to reject moisture, but rather than reject the heat removed to outdoors ; the hot condenser coil is located downstream of the chilled cooling coil and warms the air before discharging it into the conditioned space. The air is chilled below the dew point first and then reheated before circulated back into the conditioned space it serves. 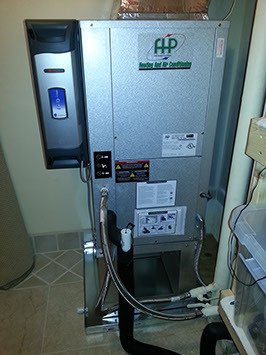 Very few dehumidification systems can operate without adding heat to the interior spaces it serves. Water source dehumidification systems are the exception and can continuously remove moisture without discharging air warmer than 70 Degrees F.
Air source dehumidification systems that operate solely with air circulated through the conditioned space often have discharge air temperatures above 90 degrees F.
All indoor self contained dehumidifiers add heat to the indoor air during operation and eventually add enough heat to the space to raise the room temperature above the thermostat’s cooling temperature set-point. The heat load created by the self contained dehumidifier causes the air conditioning system to operate in cooling mode when natural heat loads are minimal and the system would not have operated otherwise. Spaces with internal heat loads produced by lighting and appliance use produced over long durations of continuous occupancy often have sufficient heat loads to use air conditioning systems alone to control indoor RH levels without the need for supplemental dehumidification. Air conditioning systems serving multi-family condominiums often serve spaces with very low degrees of exposure to the natural solar heat load. Condominium spaces often have no heat load from above or below because the space served is insulated by the conditioned spaces of the adjacent condominium units. The exact same floor plan built upon a single family home lot with a red tile rooftop would have significantly more demand for air conditioning than when sheltered by adjacent units. Just as the energy demand would be increased the hours of continuous moisture removal during air conditioning system operation is much greater. Multifamily residences are not just insulated from outdoors by adjacent spaces above and below ; many have sheltered exposure to outdoors on one or more sides due to neighboring condominiums or adjacent air conditioned lobbies. The predominate heat load in all structures is radiant heat from solar exposure though windows and sliding glass doors. For the vast majority of residential single family homes the heat gain through windows and glass doors represents more than 50% of the total heat load for the entire structure. Interior condominium residences sheltered from above or below or on one or more sides may have window and glass door heat loads that represent 90% of the total heat gain of the space. In structures where the system is sized to maintain design indoor temperatures during periods of peak solar exposure the heat load through windows and glass doors is the predominant factor determining how many hours an air conditioning system will operate and whether it will operate for long enough durations to keep the indoor RH level in check. Hurricane shutters are an excellent way to naturally reduce heat loads during unoccupied periods. But the predominant heat loads from the windows and glass doors is greatly reduced when the natural radiant heat from the sun cannot reach the glass as it would under design conditions. Reducing the heat load saves energy when your hurricane shutters are closed by reducing the air conditioning demand ; for many it is a wise strategy for efficient environmental control of the conditioned spaces served during unoccupied periods. Johnson’s provides installation, service and support for several different types of systems that are capable of bringing fresh air into an occupied space. Some are 100% outside air systems that have the capacity and controls to continuously process outside air during all outdoor weather conditions. Others are conventional air conditioning systems or dehumidifiers that have the capability to mix in small amounts of hot humid outside air with indoor return air from the conditioned space and handle it as part of normal system operation. 100% Outside air systems have to deal with 95 degree humid outside air during the brutal weather conditions experienced during each SW Florida rainy season. Conventional air conditioning systems process return air between 75 F and 80 F degrees and lower the temperature of that air 15 to 25 degrees in order to bring it’s temperature down to 50 F to 60 degrees degrees in order to remove it’s airborne moisture content. 100% outside air machines must be capable of lowering the 95 F degree outside air 40 to 45 degrees in order to remove it’s moisture content. !00% outside air systems require specialized components and controls to handle all outdoor weather conditions between 50 F degrees and 95 F degrees. Johnson’s technicians are factory trained to install and service these systems. Johnson’s decades of experience in dealing with SW Florida’s unforgiving tropical climate enables us to understand the demands of tropical weather and the limitations and capabilities of all of the various dehumidification systems that can be used in this environment. Johnson’s provides installation, service and field support for AAON, Munters, FHP / Bosch and other predominant outside air systems by leading manufacturers. Johnson’s whole-house approach to evaluating buildings, ventilation systems and outside air infiltration vulnerabilities identifies the ventilation needs of our customers to expedite solutions that work in SW Florida. Johnson’s provides installation, service and support for air conditioning and dehumidification systems that are not capable of handling 100% air from outdoors whenever outdoor temperatures exceed 80 F degrees. These systems are designed and controlled to mix a small portion of outside air with return air from the conditioned space to reduce the capacity and energy input required to reduce it’s moisture content. Some conventional air conditioners are able to handle as much as 25% outside air when mixed with 75 F degree return air from the conditioned space. Generally they can mix in hot humid outside air with return air from indoors in amounts that do not result in a combined temperature higher than 80 F degrees. Mixed air entering the cooling coils of conventional air conditioners or dehumidifiers are kept low enough so that the air can be chilled down to between 50 to 55 degrees Fahrenheit in order to sufficiently remove it’s moisture content before delivering it into the conditioned space served. Mixed air systems are more practical for residential ventilation needs in most cases. FHP / Bosch Water Source Heat Pump Air Conditioning systems can be equipped to precisely control indoor relative humidity levels in Multifamily high-rise condominiums and commercial buildings. Optional Factory Installed Dehumidification Package maintains the user defined temperature and relative humidity levels required within the interior space. Unlike simple air conditioning systems can provide continuous dehumidification without over-cooling the space served. The vast majority of luxury high rise condominiums along the SWFL coast were engineered and built with FHP Bosch water source heat pump systems. The factory dehumidification package that Johnson’s custom orders for DH equipped models delivers precise relative humidity control for occupied and vacant spaces. Keeps removing moisture without over-cooling the space. Allows users to specify RH level and maintain vacant spaces at a dry 75F to 80F degrees without worry of high indoor humidity levels. Systems can be controlled and monitored remotely with temperature and humidity email and text alerts.